For a while now I’ve been swooning over all the beautiful mid century furniture that’s been showing up all over the place. Unfortunately it’s all pretty pricey. And we all know what I do when I don’t want to pay for something…I make it myself. 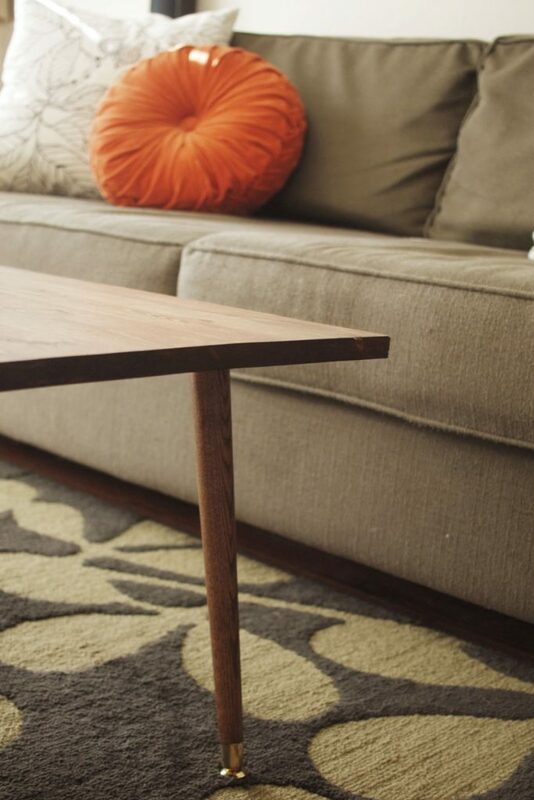 Mid-Century Modern style is so clean and simple which made this coffee table super easy to make. I mean you really can’t get any easier then this! STEP 1: Start by sanding all of your wood pieces. STEP 3: Once your stain is completely dry, use your other foam brush to coat the pieces with polyurethane. Once dry add another coat. STEP 4: Set the board on a flat surface with the bottom facing up. Measure in 6″ from the end and 2.5″ from the side. This is where the middle of the bracket will be positioned. Do this 3 more times on each corner. Then screw on each bracket. STEP 5: Screw on all the legs and turn the table over. 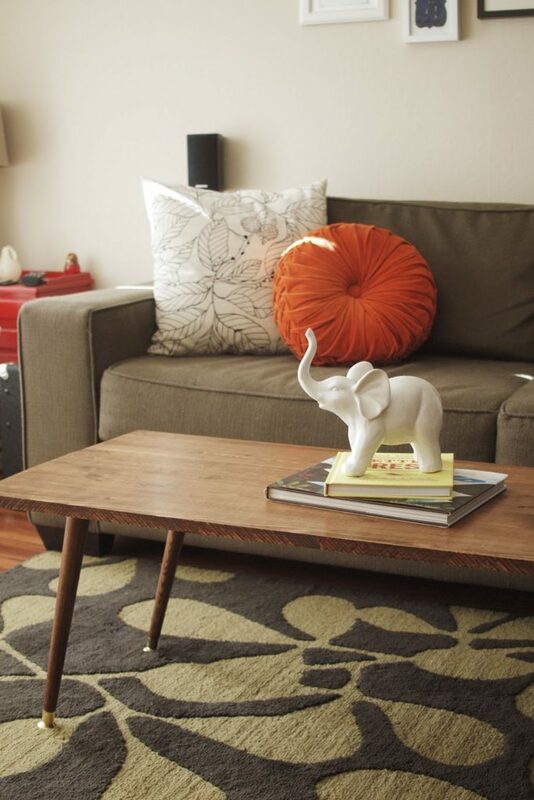 STEP 6: Sit on your couch and prop your feet up on your new coffee table. What an awesome table! I would have never guessed it was so easy or inexpensive. Guess I just got another addition to my to-do list. Thanks for sharing! I love Mid Century Modern too! We only pick up pieces from thrift stores, but that can even get expensive at times. Well you crafty little bugger. Turned out magnificent! I think I want to be you when I grow up. fantastic work!! i like the table a lot! Thanks everybody! So glad you all like it. Does anyone know where the Elephant is from?? It is soo adorable! I got it at Ross for only a few bucks! The rug is from Target! Do you remember what the rug is called? I tried to find it on the website, but nothing came up. Love your style! Great question Jen. It's pretty sturdy. I guess I probably wouldn't sit on it though. But it's perfect for holding books and drinks. Other than that it's a prefect size for our little apartment size living room. I'm buying my first house two weeks from today and I love all things midcentury. But you're so right, they are pretty pricey, even at thrift stores nowadays. I am completely in love with this table and I'm going to Lowe's Sunday afternoon to buy everything I need! Thanks for the wonderful tutorial! Yay! I'm so glad you're giving it a try. This coffee table will surely fit our Mid-Century themed house. I like how the carpet, sofa and the table were being put together; with the help of my husband we’ll surely follow your steps and I hope it will be a success! Have fun Morgan! It's really easy so I know you will succeed. What are those brackets you used for the legs? The table seems to be a common table sold online, but the idea that you made it yourself is something that feet-propping-worthy. Hi Victoria, the brackets we used are called "Angle Top Plates" These is a link under the supplies list if you want to check it out! What I find striking about this table is the color. I'm not really fond of lacquered (or near-lacquered) furniture, but this one gives me a different feel. I guess it's because of the gold accents on the legs. Is it even lacquered, by the way? We used Varathane Premium Satin Polyurethane after we stained it. I like how this center table has the rough-finish look to it. Kind of gives it a different kind of texture and feel when you look at it. Thanks for the awesome plans. I expanded slightly on the original design by placing two 20in 1x2s across the short side and putting a second pine panel on top. The design is a little more substantial and allows a few small cubbies to place magazines or remotes. I may build a tray to go in the middle hole. For those interested I spaced the 1x2s (with the long size vertical) 12inches in from the board (so the outer cubbies are 12in and the inner cubby is 24in wide). Thanks again for the create plans and design! This is really great! My husband and I are looking into a few options for doing a coffee table much like this, but are worried about the cost. Do you remember how much your materials came to when you were finished? I'm not exactly sure. Maybe around $50 for the table materials not including the stain and tools that we had. ah! I want to make this! i've been living sans coffee table for too long. What a good and staunch furniture so lovely to look at. Significantly perfect for my house design in living which is more important that anything else. I really like to improve my living room. The sofa is so neat and good for my house design. I really like the concept of the interior design. This kind of households can instantly make you rest, because of a nice design of furniture and soft cotton of chair to make you more comfortable. This is so gorgeous! I'm in love! We used our Olympus Pen E-P1 for these photos, but now we use a Canon 70d. 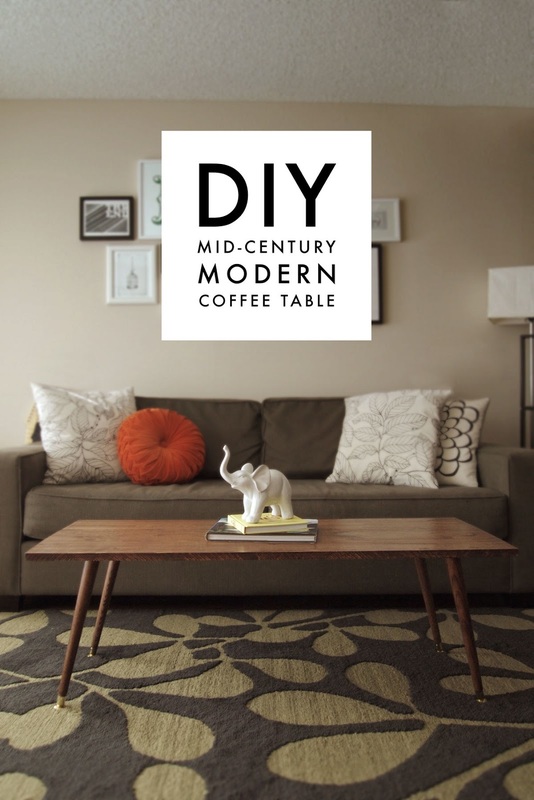 I just love this DIY mid century modern coffee table pretty much. I think it's a brilliant design and for home decoration such furniture is enormous. Just surprised to see how creative work can anyone produce through DIY. 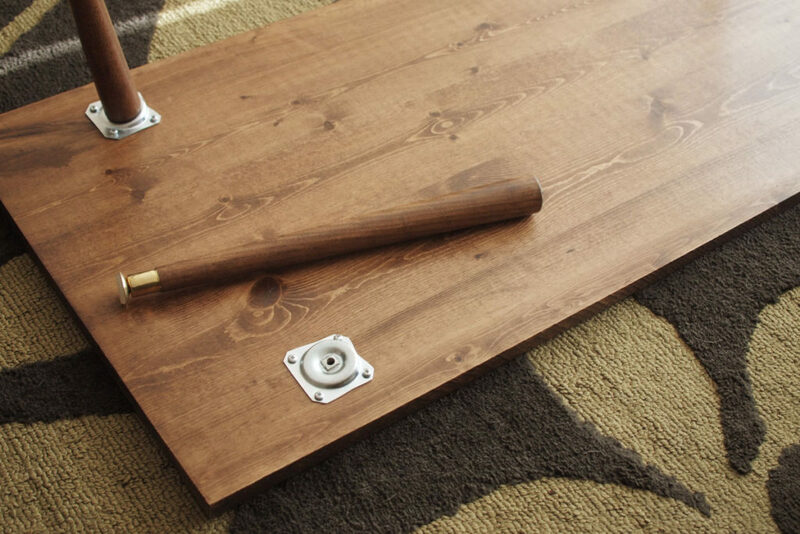 This an amazing review of DIY mid century modern coffee table. I'm a great fan of unique designed tables and glad to find some furniture line from my favorite. These furniture's are decorative as well for home or office decoration. Thanks. 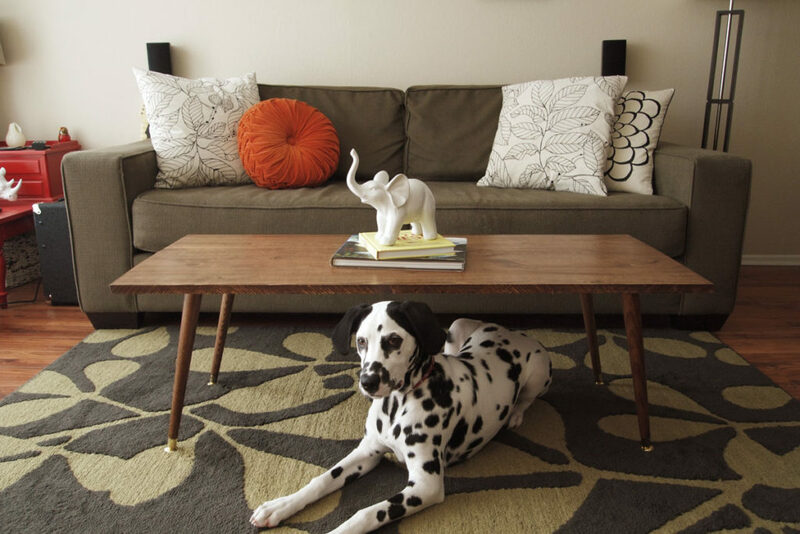 Quite a nice DIY mid century modern coffee table!! I really like that table and flexibility of using of that table is very impressive indeed. Thanks. Just found your post and it's EXACTLY what I needed –thank you! Hello, thank you for such an amazing DIY. You need a power drill to attach the angled top plate correct? Thank you! Also, could this be made into a side table as well? Do you remember about how much the 20" x 48" Plum Creek Ponderosa Panel cost you? Thanks! I hope to try this! Also, where did you get your couch? Or, does it have a style name?Thank you! I really like this table. I'll do it for sure. Thanks for the post !